In this paper we present an approach to approximate reachability computation for nonlinear continuous systems. Rather than studying a complex nonlinear system x = g(x), we study an approximating system x = f(x) which is easier to handle. The class of approximating systems we consider in this paper is piecewise linear, obtained by interpolating g over a mesh. In order to be conservative, we add a bounded input in the approximating system to account for the interpolation error. 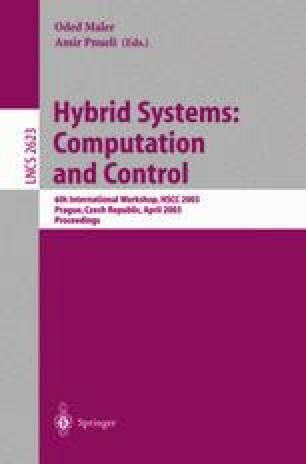 We thus develop a reachability method for systems with input, based on the relation between such systems and the corresponding autonomous systems in terms of reachable sets. This method is then extended to the approximate piecewise linear systems arising in our construction. The final result is a reachability algorithm for nonlinear continuous systems which allows to compute conservative approximations with as great degree of accuracy as desired, and more importantly, it has good convergence rate. If g is a C 2 function, our method is of order 2. Furthermore, the method can be straightforwardly extended to hybrid systems. Research supported by European IST project “CC - Computation and Control” and CNRS project MathStic ”Squash - Analyse Qualitative des Systèmes Hybrides“. E. Asarin, T. Dang and A. Girard. Reachability Analysis of Nonlinear Systems using Conservative Approximations, Technical Report IMAG Oct 2002, Grenoble http://www-verimag.imag.fr/~tdang/piecewise.ps.gz.